Girlfriend Recommended: Beauty Product Organization - Clean Science. Professional Results. Working at MyChelle definitely has its perks – not least of which is access to so many incredible skin care products! If you’re as much of a fan of skin care and cosmetics as we are, then you are probably familiar with this problem: So many products, so little counter space. From jars of moisturizer to tubes of lip gloss to sets of brushes, the tools of our beauty regimen seem to multiply – and amount to clutter. First of all, blogger Liz over at Designing Domesticity totally masters the cluster of mix-matched bowls. The result manages to be both casual and elegant – and for bonus points, try replicating that lovely necklace storage masterfully disguised as wall art! … And while you’re in do-it-yourself mode, why not try Snapguide’s guide to removing residual wax from candle jars? 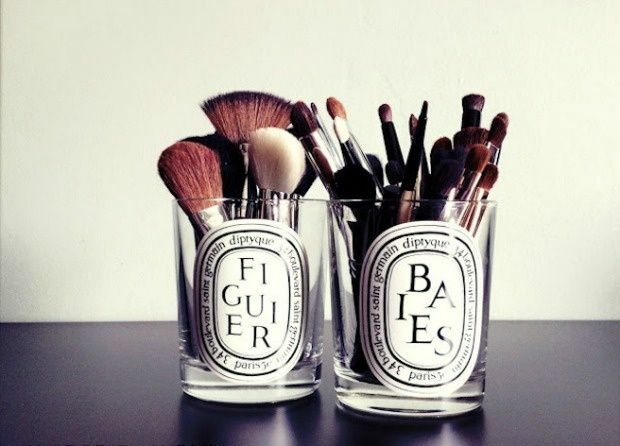 Once cleaned, those pretty jars can live a new life as storage bins for your make-up brushes and sponges, à la this example. If you’re on Pinterest, then you’ve probably seen quite a few versions of the magnetic make-up board trend by now. Laura Thoughts offers a wonderful round-up of her favorites, and Christina’s Adventures gives us step-by-step instructions (complete with photos!) for how to achieve your own. You can easily customize with your fabric of choice, and then either leave the final product on full display or discretely hide it on the inside of a cabinet door. Lastly, this dressing table drawer by Burning Blonde is a beauty-lover’s dream come true. The savvy blogger separates her skin care products using the lids of boxes, in all different shapes and sizes. What a great idea for recycling boxes! Have you got a tip or trick for storing your various skin care and beauty products? If so, we’d love to hear it! Please drop us a line in the “comments” section below – and remember to enter our Daily Giveaway on Facebook to score even more fantastic products from MyChelle!